You won't believe what happened when this guy sent a text back in time. 1. Do not discuss past the covered episode in the post. Because people are expected to have already watched the week's episodes, spoiler tags are unnecessary. 2. If you've seen the series beforehand, please don't ruin the fun for others and spoil the story (especially with Steins;Gate!). Discussion of such material is not prohibited but please exercise caution in posting. If you really wish to discuss material further along than what we've watched (which is fun for a series like Steins;Gate because of the time travel mechanic which reveals unexplained stuff in the earlier episodes), please put bountiful and large spoiler warnings. Replies to spoiler-y material should also have spoiler warnings. 3. GIFs are appreciated. Have fun and be nice or whatever! I didn't really notice it before but the time leap mechanic is really clever. Getting the materials from Akiba (even the modified Akiba) seems doubtful but the rest of it sounds really good. 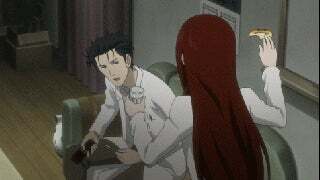 Anyone thinking Kurisu is "attracted" to Okarin because of her dady issues? Anyway, any scene with Okarin and Kurisu in it is really good. I'm watching it while working but any time that the two have a scene I always stop and watch. The two of them just have really great chemistry. Add to that the fact that their voice actors are simply amazing. Also, Suzuha <3 Flat is justice but we need more Suzuha. Ok, now, we can't end this meeting without mentioning Episode 12! I love how reasonable he was with deciding to reveal the discovery with the world instead of further using it for their personal amusement/curiosity. They also showed the way he was tormented by the knowledge and the threat of the time leap machine itself and external forces. The best choice might have been to destroy the machine but they're scientists and I think they couldn't resist sharing this discovery with the world. And who didn't squeel a little when Kurisu was acting all "un-assistant" like? One weird thing about this series is that the foreshadowing has a stronger effect when you're watching it for the second time. The whole thing was just tense for me. The clock stopping, all those weird cuts and everything else just works even when you know what's about to happen. I'm guessing a number of you watched at least one more episode because of that ending. How could you not watch more after that!? And as I've said, if you still don't like the series at this point, it'd be safe to drop it. Go on and discuss but please don't forget to be mindful of spoilers! If you really want to discuss further than episode 12, please include heavy spoiler tags in every comment including the replies to those, thank you! Please don't forget to watch the next three episodes of Steins;Gate (13-15) for next week's meeting. 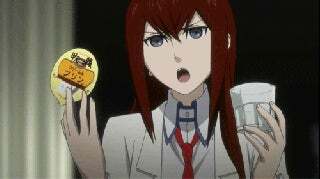 I love Kurisu more. Visit TAYClassic or the TAY IRC for more justice.